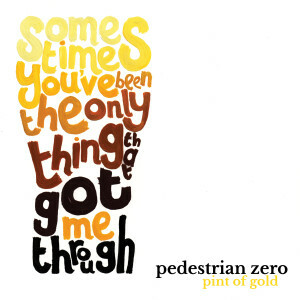 Pint of gold was one of the first of a batch of songs I wrote starting in the autumn of 2011. It was written in honour of a good friend, Matt Hat, who helped strangeday out with a bunch of stuff without expecting payment of any type. The promise always was that we’d buy him a pint of (literal) gold when we were rich and famous. This song is in lieu of one of the pints of gold that never materialised. I had decided to record a new song every month in 2016 no matter who was about. I’d long wanted to record this song properly, but it never seemed to fit with either strangeday or Roo’s Radio so when no-one else was available to record in January I jumped at the chance to record this. It was originally a slow song, but when Paul said he wanted to give it the ‘full rock’ treatment, I turned it into an upbeat foot-stomper with some help from Cec. To give you some idea, the original song was just under four minutes long, and it’s now just over three minutes long. When talking to Paul about bassists, I was considering asking Si from 3dBs Down if I could borrow his bass guitar when it occurred to me I could just ask him to record the bass. He said yes, and with drums from Paul and backing vocals from Paul and Cec, the rest, as they say, was history.